In the Autumn Trav and I found out about a program for the Epic Kids School Pass... a pass that gives kids 4 free ski days at 4 different ski resorts. 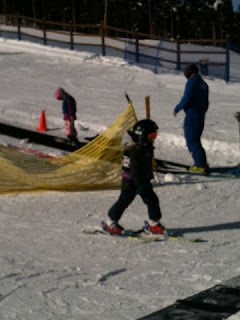 It was the perfect way to introduce Gwen to skiing, with no pressure. Last weekend Trav and Gwen got up at the crack of dawn (5:15am) to head out for Gwen's first experience on the mountain. With the pass, you also got a free lesson! 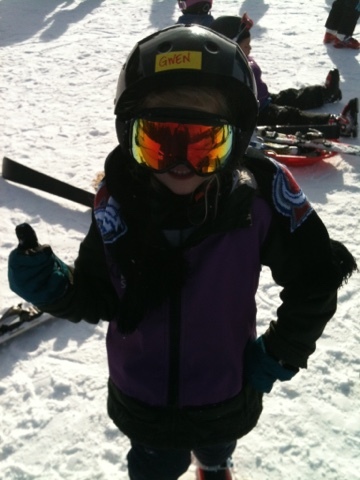 So Trav checked her in and she was on her way to being a skier! The lesson lasted all day, so Trav headed up to make a few runs himself, periodically checking back in. She loved it. By the time she got home (not until 8:30, they hit a lot of traffic), she was exhausted and had slept for much of the time in the car and was ready for a lot more sleep in her bed. But she's excited to go back! She gets 3 more skies with Trav on this mountain, and who knows, maybe by next year she'll want a real pass! 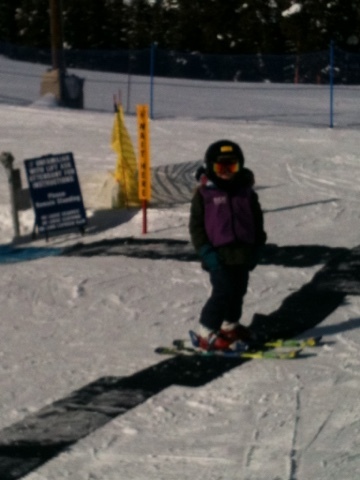 Look at our little Coloradan! Girls Night - Hockey Edition - Times Two!